Both the Google Nexus 4 and the Samsung Galaxy S III have 8MP cameras, but that's not to say they produce photos with the same quality. Actually, there's no way around it, the Galaxy has the better camera. The photos taken with the Nexus 4 have a lot of noise in them, even after noise reduction, and the phone gets pretty aggressive with the sharpening to bring back the lost detail. The results are especially visible in the sky. Colors are fairly accurate (saturation isn't artificially boosted like on most other phones), though the white balance can be a bit off some times. Photos from the Galaxy S III have much less noise and a lot more detail in them. 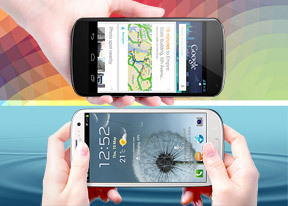 The S III also has better dynamic range and loses less detail in properly-lit areas. Colors are oversaturated but not out of proportion, and white balance is good (may be a bit on the cold side for some people). And here are the full resolution samples for the pixel peepers. For even more of the same, head over to our Photo quality comparison tool to see how both phones handle our standardized charts. 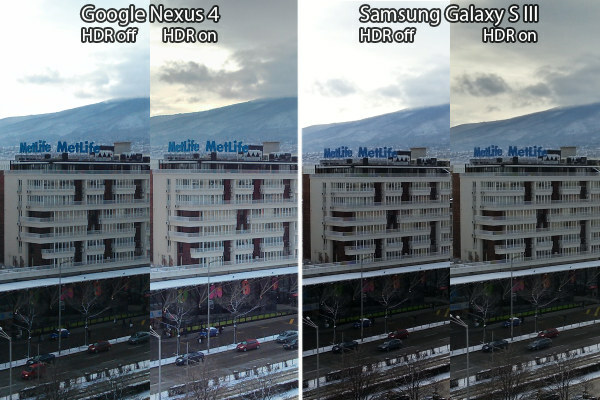 We also tested the HDR feature of both phones to find that their approaches differ. The Nexus 4 goes for wider dynamic range and tries too hard to bring out detail in both the highlights and the shadows. The resulting noise in the shadows is quite evident though and the contrast drops. The Galaxy S III is more conservative and mostly adds detail to the highlights, shadows are barely changed. 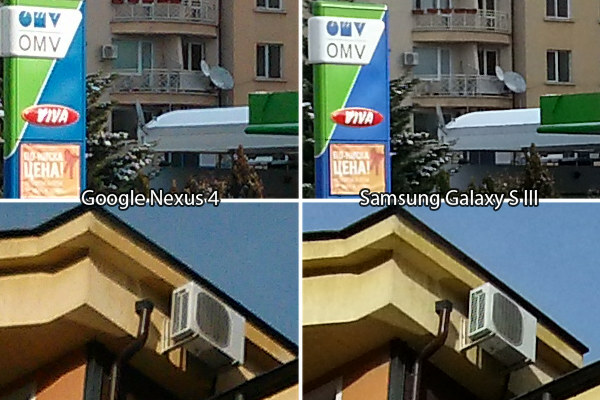 It resolves more detail than the Nexus in the bright areas (especially the sky on a cloudy day). You're not going to notice much improvement in the dark areas (but no noise either). The choice between the overstated HDR effect in the Nexus 4 shots and the gentle processing in the Galaxy S III is a matter of personal preference. Have a look at the crop below, which incorporates highlights and shadows (we shrunk the photos to 25% before making the crops to fit more of the scene). You can also view the full resolution shots, which give you a better look at the captured detail and noise. By the way, the Galaxy S III saves both an HDR and a regular copy, which is great if you don't like how the HDR image turned out. The Nexus 4 saves only the HDR shot. We tested the panorama modes as well. We used both the regular panorama and the Photo Sphere modes on the Nexus 4, while the Galaxy S III takes part only with the regular panorama. Comparing just those panoramas, the Galaxy S III has a clear advantage - it offers double the vertical resolution, not to mention more detail and better dynamic range (which is important as panoramas often cover both well-lit and shadowy areas). The S III continued shooting until we did a full turn, while the Nexus stopped halfway through. A Photo Sphere is composed of many photos and the amount of captured detail improves considerably over the normal panorama mode of the Nexus 4. 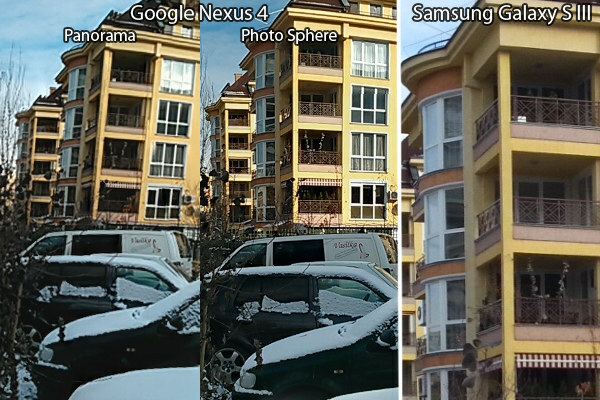 Creating personal Street View-like shots is great but we should warn against several disadvantages. First off, shooting a Photo Sphere takes quite a bit longer than a regular panorama, at least if you want to complete the sphere (you don't have to). Another thing is that when viewing the resulting image in a regular photo viewer, objects in the photo appear distorted. You need a special viewer on your phone / computer - it works just fine if you upload it to Google Plus, but if you email the JPG to someone, they're unlikely to have a spherical panorama viewer installed. Here go the full resolution panorama samples. You'll notice that neither phone managed a perfect stitch and there are some obvious artifacts, not to mention distortion throughout the image. You can view the Photo Sphere on our Google Plus page to see how it looks in a proper viewer too. Winner: Samsung Galaxy S III. Overall better image quality and a bigger set of features outweigh the sleeker UI and the Photo Sphere feature.